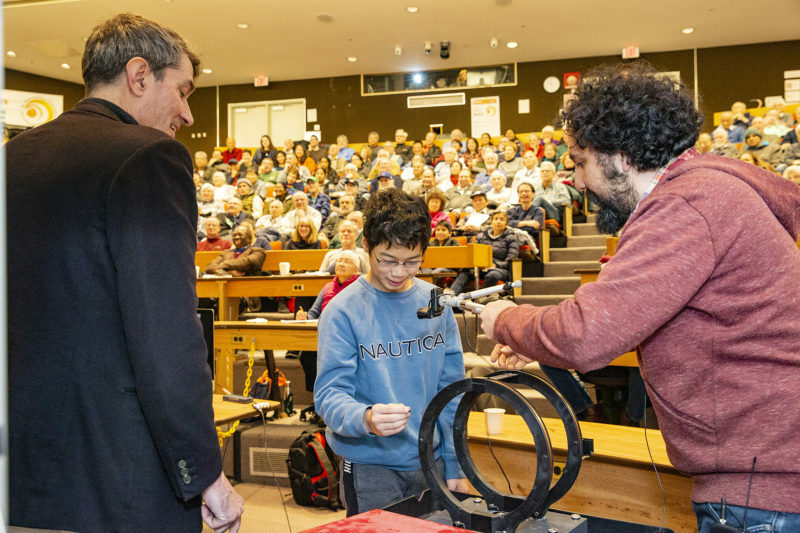 At the Princeton Plasma Physics Laboratory’s (PPPL) Ronald E. Hatcher Science on Saturdays Lecture Series, audience members might be as young as 9 and as old as 90. The popular talks on a range of scientific subjects have been attracting people curious about all aspects of science for more than three decades. The program is named for Hatcher, an engineer who hosted the lectures in the past and died in 2014. It is funded by the DOE’s Office of Science. All talks are free. Later topics are “Managing Coastal Risk in an Age of Sea-level Rise” by Rutgers Professor Robert Kopp on March 2; “Tracking Water Around the Globe — in the Atmosphere — Surface and Subsurface” by University of Illinois Associate Professor Francina Dominguez on March 9; and “How Deep are Plant Roots? Take a Guess” by Rutgers Professor Ying Reinfelder on March 16. Talks, which begin at 9:30 a.m., are held in the Lyman Spitzer Building, 100 Stellarator Road. Visitors are advised to arrive at least an hour early to get a seat. Coffee and bagels are served. Lectures can also be viewed live at www.pppl.gov/node/7641.